I would've loved Unicorn Store when I was about 13 or 14 years old. That was the age I was cutting old pairs of jeans into shorts and bedazzling them with rhinestones applied via hot glue gun. It was when I wore rainbow-patterned knee-high socks to counter the blandness of my school uniform. At that age, I saw Garden State and thought Natalie Portman's character was the coolest person I could imagine because she was weird and listened to The Shins. Yes, at that age I would have loved Brie Larson's directorial debut, about a young woman named Kit (Larson), who loves rainbows and sets out to get her very own unicorn. Seriously, that's what it's about. I tried to keep this in mind as I watched Netflix's latest release. After all, the movie practically begs you to indulge your inner child. But the adult in me prevailed, and I spent too much of the running time desperate to scream at the screen: Grow up already. One thing you should know about Unicorn Store: The unicorn is not metaphorical. We're introduced to Larson's Kit just as she gets kicked out of art school for painting a neon-and-glitter Pollock approximation that's not to the liking of her stuffy teachers. To be fair, a wide shot suggests the assignment was to paint a self-portrait, and Kit has obviously interpreted the directive in abstract terms. She retreats home, where her overeager parents (Joan Cusack and Bradley Whitford) try to feed her healthy meals -- she hates kale -- and set her up with an employee at their business, a sort of therapeutic camp called "Emotion Quest." She decides to get a temp job, and around the same time she starts receiving mysterious letters inviting her to "The Store." This turns out to be the titular Unicorn Store. 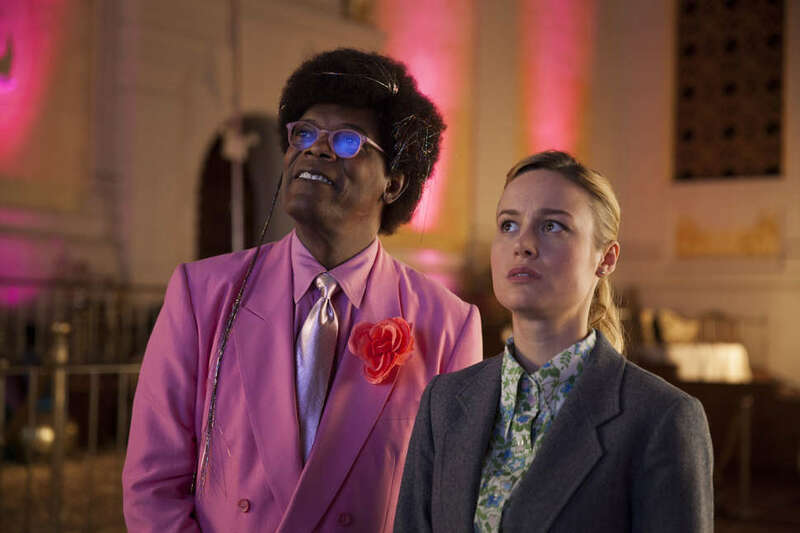 There she meets a man known only as "The Salesman," a sort of Wonka-esque figure played by Larson's Captain Marvel co-star Samuel L. Jackson, who dons brightly colored suits and wears tinsel in his hair. He explains that if she can prove that she's prepared to house a unicorn, he can get her one. The plot then aimlessly drifts as Kit preps for the arrival of her unicorn. She enlists an amiable hardware store employee, Virgil (Mamoudou Athie), to help her build a stable, and starts dying hay different colors. (I guess unicorns eat rainbow hay.) Meanwhile, her parents are growing increasingly concerned, and her boss (Hamish Linklatert) is becoming increasingly creepy. In front of the camera, Larson is as engaging a performer as ever, but Samantha McIntyre's erratic script makes it hard to pin down exactly who Kit is as person beneath all that affection for a Lisa Frank aesthetic. She's almost disconcertingly naive at times, like when she asks Virgil if her superior at work is sexually harassing her. (He clearly is.) In this sense, she reminds me of another Netflix heroine: Kimmy Schmidt, except Kimmy spent most of her formative years in a bunker. Kit -- as far as we learn -- did not. In a crucial monologue (spoilers, I suppose), she reveals her parents never got her pet in her youth, but that fails to resonate as a source of any real trauma. She craves unconditional love, but never considers that having meaningful relationships with other humans means compromise. It's almost admirable how committed both Larson and McIntyre are to Kit's point of view, but it's to the detriment of their film. By refusing to take any of Kit's critics seriously -- even the ones with who are justified in their incredulity, which is pretty much everyone when they hear she has plans to own a unicorn -- it renders the action dramatically inert. There's something almost admirable in Unicorn Store's stance against the growth of its protagonist, but it's also more unbelievable than, well, a store that gives away unicorns. Larson has a knack for capturing her spin on the "Spielberg face" -- Kit's look of wide-eyed wonder that bookends the narrative -- and her use of color seems destined to live on in Tumblr gifs. She's also assembled a strong cast here, but they're almost entirely underserved by the material. No one's opposed to a little magical realism, but Unicorn Store never truly wrestles with its fantasy or the real world it's trying to portray. The only thing it does commit to is a blind believe-in-yourself faith that will seem trite to its older viewers and could be almost harmful to its younger ones. There are almost built-in counters to any criticism of the movie. You don't like it? Well, that means you're jaded. And while I probably would have loved this movie as a kid, I also would have grown out of it quickly. Sometimes glitter, rhinestones, and paint just make a mess.